The holidays are flying by! Just New Year’s Eve and we are back to dreary winter with a far off February break to look forward to. I actually love winter, but I’m still waiting for it here on the East Coast. No snow yet and it makes me sad! Who knows if I’ll still like winter now that I’m living in the city, but I’m willing to give it a shot. I mean, it hasn’t even really been cold enough for hot chocolate, and what is the point of winter if not to drink copious amounts of hot chocolate? On a side note, I think you should make these stuffed mushrooms for you fancy New Year’s party to serve while you sip on champagne and make plans for the awesome year to come. 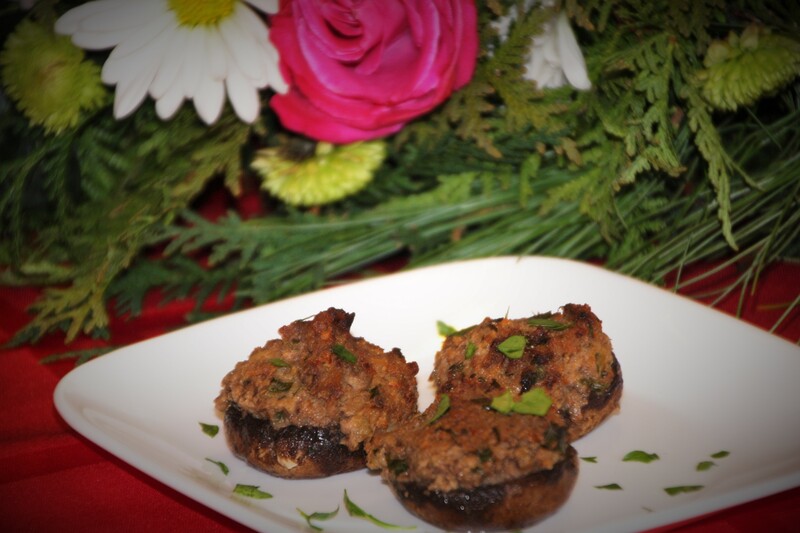 These stuffed mushrooms have been a part of my family’s holiday table for a very long time, well, not these exactly. I had to develop a vegan recipe that brings all the yummy to the table. These have gone through lots of trials, and this is a very tasty and simple way to make them. I hope you enjoy! Remove stems from Mushrooms. Chop stems and set aside. Place Mushroom caps in a baking dish. Pour a few drops of lemon juice into the center of each cap. Heat oil in a skillet. Add mushroom stems, shallots and garlic. Sauté until soft, about 5 minutes. Add the salt and white wine. Stir until combined. Add the Cream Cheese , tahini and nutritional yeast. Stir again and remove from heat. Add Bread crumbs until totally incorporated and the mixture becomes stiff. Stuff each cap with mixture to very overflowing. Bake for 35-45 minutes, until caps are soft. Serve immediately.